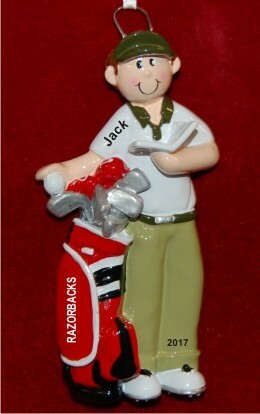 The design of this personalized golfer gift idea is fantastic right down to the cool golf spikes! The fellow in the male golf personalized Christmas ornament is selecting a fairway iron to stick a shot close to the flag. Great colors and a cheerful grin are enhanced by adding custom details that make this one of a kind gift for your favorite player. Our lettering artists add the details by hand in a font more stylish than the one shown for clarity. It arrives ready to display in our handsome and plush velvet drawstring bag. Surprise him this holiday season or on his birthday or Father's Day with the nicely crafted male golfer personalized Christmas ornament from Russell Rhodes!